Comptroller Peter Franchot has endorsed County Executive candidate David Blair. Franchot is popular with moderate, anti-establishment and pro-business Democrats and this could help Blair consolidate those groups. We reprint Franchot’s blast email below. As a proud Montgomery Countian who has lived in Takoma Park for nearly 40 years, I’m proud of the caliber of the candidates who are running to succeed my friend, the great Ike Leggett, as our County Executive. When we head to the polls on June 26, or during the early voting period, we will have the privilege of choosing one of several talented public servants with records of true accomplishment in both local and state government. As your Comptroller and Maryland’s Chief Fiscal Officer, I believe we must elect the candidate with the right blend of values, experience and vision to ensure our County’s long-term competitiveness and economic prosperity. For me, that candidate is David Blair. David is a lifelong Montgomery Countian who built one of America’s most successful health care companies right here in the county – one that began in a single room and went on to sustain thousands of family-supporting jobs. There is nobody who has a clearer understanding than David of the pressures facing Montgomery County’s working, middle-class families – far too many of whom have seen the size of their paychecks stagnate while the costs of living continue to rise. There is also nobody who knows better than David that Montgomery County simply cannot sustain necessary investments in exceptional public schools, gridlock relief, safer communities and community reinvestment if we do not act immediately to create a stronger and more competitive business climate. The priorities that we all share are essential, but none of them are free. That is why it is so essential that we create an environment where the government is more responsive to the entrepreneurs and small business owners who are the backbone of our economy. That’s why it’s so vital to send the message that in Montgomery County, economic development and social justice are complementary values, and that one cannot occur in the absence of the other. And it’s why we must embrace policies that allow the innovation of the free market to thrive – beginning with an end to the government liquor monopoly that has done such a profound disservice to our consumers, small business owners and the Montgomery County economy. This is the change that David Blair will bring to Montgomery County. David has the vision and the experience of a leader. As someone who has given so much back to our community through his work to end homelessness and poverty, create better early childhood learning opportunities and improve the lives of people with disabilities, he also has the values of a true public servant. David Blair is my choice for Montgomery County Executive, and I respectfully ask that you consider his candidacy. To learn more about David and his campaign, please visit www.blairformontgomery.com. Thank you, as always, for your continued friendship and support. For many months, rumors have abounded about the Democratic establishment seeking to find a primary challenger to its hated nemesis, Comptroller Peter Franchot. But at the close of candidate filing, it became clear that the effort to oust Franchot had failed. 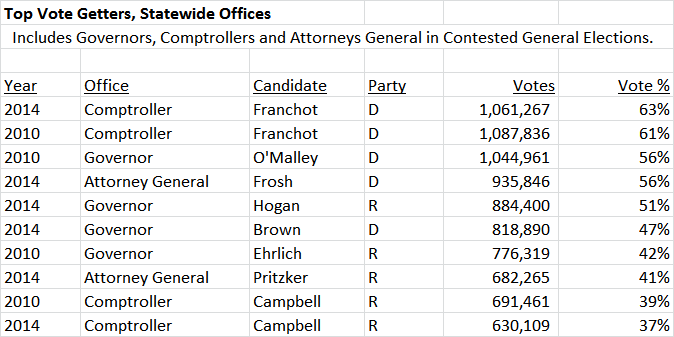 The Comptroller has no Democratic opponent, and with only an unknown Republican running against him, Franchot is certain to get four more years in office. Among the statehouse’s leadership, Governor Larry Hogan is regarded as a rival but not a bitter enemy. That’s because since the Governor is a Republican, a certain amount of political competition is expected. Franchot, on the other hand, is despised by the Annapolis Democratic ruling class. As a Democrat and a former twenty-year Delegate, someone in Franchot’s position would normally be expected to be a loyal player on Team Dem. Instead, the Comptroller is the leader of Team Franchot – a team with different interests and tactics than Team Dem – and the leaders revile him as an apostate. Understanding Franchot requires breaking out of the conventional political box – something the Comptroller specializes in. Here are four facts about Franchot that players in state politics should recognize. Let’s go back to 1986. District 20 State Senator Stewart Bainum was leaving his seat to run for Congress. Two Delegates, Ida Ruben and Diane Kirchenbauer, ran for the open Senate seat. But Ruben was not content to go to the Senate – she wanted to control the entire district. So Ruben put together a slate including incumbent Delegate Sheila Hixson, MoCo Democrat of the Year Robert Berger and former Takoma Park City Council Member Lou D’Ovidio. Franchot, then a young aide to Massachusetts Congressman Ed Markey, was having none of it. He launched an aggressive door-knocking campaign for Delegate running against lobbyists, greedy banks, insurance companies and “special interests” of all kinds. Franchot finished first in the Delegate race, surpassing even Hixson, and learned an early lesson: revolting against the establishment, both political and economic, could be electorally rewarding. Franchot targets special interests in a 1986 mailer. That was just the beginning. Two years later, Franchot ran a tough and occasionally negative race against the new darling of moderates in MoCo, Congresswoman Connie Morella. (This is the only race Franchot would lose.) In 1992, Franchot backed an ill-fated coup attempt against House Speaker Clay Mitchell. Mitchell’s rival, Nancy Kopp, would go on to be rehabilitated, but Franchot was sent so far to the back of the bench that he could have been sitting in a Bay Bridge toll booth. After the 2002 election, Franchot began running against Mister Maryland, Comptroller William Donald Schaefer, and even took out a $750,000 loan on his house to do it. After winning an upset victory, Franchot then fought with Governor Martin O’Malley and the legislature’s presiding officers over slots and other issues all the way through Hogan’s election. And the fight goes on over craft beer. Here is a partial list of all the establishment figures Franchot has taken on in the last thirty years: two incumbent Delegates in his home district, a popular Congresswoman, multiple House Speakers and the Senate President, a sitting Democratic Governor and one of Maryland’s most influential all-time political figures in Schaefer. No other politician has assembled such a list and survived. 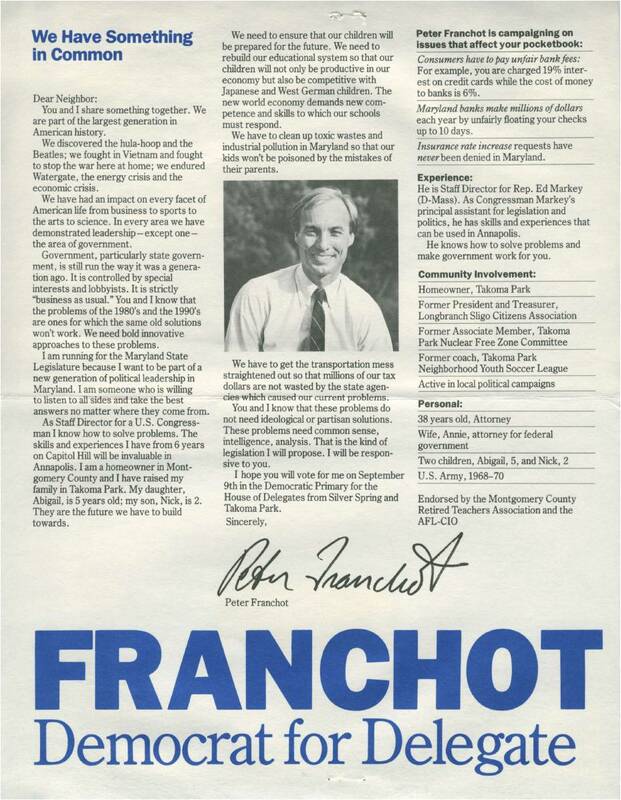 And yet here is Franchot, more than thirty years later, with no primary opponent. Think of some of the issues Franchot has taken on in the last decade: opposition to slots, cracking down on fraudulent tax returns, getting air conditioning in Baltimore County schools, opposing MoCo’s liquor monopoly, moving the start of school until after Labor Day and liberalizing state laws on craft beer. These issues seem like an eclectic set but they have two things in common. First, none of them are partisan or ideological issues. Folks in the left, right and middle can agree on many of them. And second, the constituencies in opposition are attractive opponents to have: casino conglomerates, tax cheaters, corporate mega-beer producers and incompetent bureaucrats. To quote former Illinois Governor Rod Blagojevich, from a political perspective this is [expletive deleted] golden. Franchot has picked up allies and admirers in all these fights who range all over the political spectrum and will never desert him. How many Maryland politicians can make that claim? Moreover, despite the contempt that the establishment holds for Franchot, he has had his share of wins. Pressure from Franchot and Hogan has helped accelerate Baltimore County’s school construction program. Hogan’s executive order on school openings after Labor Day, a Franchot idea, has gone unchallenged. Last year, Franchot got a major tax fraud bill passed through the General Assembly. And the current efforts to put slots money in a lockbox for education is a big vindication for Franchot, who has argued for a decade that gambling money was not used for schools as promised but has instead been poured into the general fund. We will see how his current craft beer crusade turns out. Most politicians are driven by ambition and fear. Ambition, typically manifesting as a drive for higher office, causes politicians to take risks, stand out and appeal to critical interest groups. Fear can be healthy when it aids self-preservation, including fear of being disliked, embarrassed, ostracized or losing an election. The behavior of most politicians involves a competition and balance between these two competing traits. In a sense, Franchot has neither of them. Franchot’s absence of fear is obvious. The scathing denunciations of Franchot by O’Malley, the legislature’s presiding officers, the Baltimore Sun editorial page and various dukes and barons of Annapolis would scare the living daylights out of most politicians. Not Franchot. He not only doesn’t care; the confrontations actually energize him. Your author has seen him grin and rub his hands together in glee at the prospect of taking on folks whom he would call “bullies and bosses.” No other influential figure in state politics acts like this. But here’s the thing: Franchot also lacks any ambition for higher office. He figured out some time ago that Comptroller is a great job. Franchot doesn’t have to vote on controversial bills, draft budgets, raise taxes or say no to constituents. He gets to travel around the state, hand out awards to small businesses, get involved with issues of his choice and, as long as tax refunds go out quickly and efficiently, he can do all of the above as long as he likes. So he isn’t going to run for Governor, Congress or anything else. That frees up Franchot from having to compete for all of the Democratic interest group support he would need in a competitive primary with quality opponents. That means he gets to set his own agenda in a way other politicians can’t. And boy, that has been a major asset to him. If you’re a leader in the Democratic establishment, there are only two ways to deal with the occasional and inevitable Franchot eruptions. You can ignore them. You can co-opt them. Sometimes you can do both. But whatever you do, don’t take on Franchot directly. Then he gets to fight “bullies and bosses,” and either gets his way or he gets to be martyred in front of legions of adoring supporters. Either way, he wins. The recent craft beer fight is a good example of mishandling Franchot. Maryland’s alcohol laws are notoriously anti-competitive, although they have very slowly begun to liberalize. 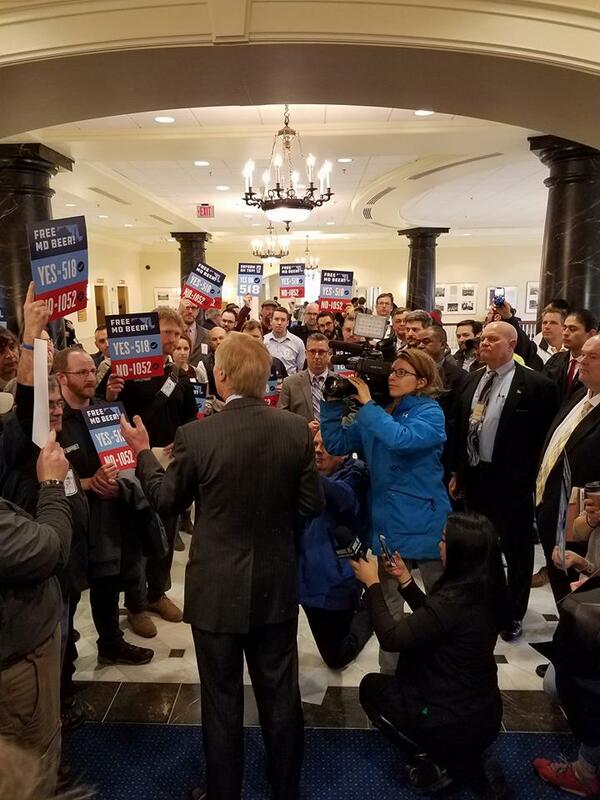 Franchot rightly criticizes the state’s beer franchise laws, which essentially establish state-sanctioned distribution cartels, and he ridiculed a requirement in a bill passed last year that craft breweries send some of their beer to distributors and buy it back before serving it in their tap rooms. Then he set up a task force to give his proposed beer law reforms legitimacy and had his army of craft beer supporters descend on Annapolis. What to do? The rational response would be to ignore and co-opt. From a strictly political perspective, the establishment should have given Franchot’s bill a polite hearing but otherwise ignored it. Then they should have extracted pieces from it that the distributors could live with, pass those in a separate bill sponsored by state legislators who could use a bump, and declare victory. Franchot would declare partial victory too, but who cares? But this is Franchot so rationality went out the window. Instead, the leaders put forth two bills: one to retract the improvements the craft breweries won last year and another to form a task force to study whether the Comptroller’s alcohol regulatory authority should be taken away. The establishment’s reward was an all-day hearing that degenerated into a searing circus featuring angry and sputtering Delegates, militant craft beer advocates, allegations of payoffs through booze industry political contributions and a starring role for Franchot who got to denounce “back room deals.” They gave Franchot exactly what he wanted: a swarming sea of fans and HUGE press attention. How exactly is this supposed to encourage him to behave differently in the future? Franchot preens like a peacock before press and supporters outside the House hearing room where his craft beer bill was discussed. Credit: Franchot’s Facebook page. There are 188 members of the General Assembly. The place needs hierarchy to operate. There must be organization, leadership, direction and consequences for violators. Otherwise, nothing would get done. All of this means that if the establishment didn’t exist, we would have to create one. That said, establishments decay and become obsolete when they go unchallenged. There’s a valuable role for disrupters like Franchot: they keep the leadership on its toes and make sure issues that do not originate solely within favored interest groups get addressed. This push and pull keeps the place vibrant and relevant and, over the long run, makes it better. The leadership may not always like that. But they’re going to have to deal with it, at least for another four years. Disclosure: The author has done campaign work for Peter Franchot in the past but has not worked on his current campaign on craft beer. A General Assembly compromise passed on Sine Die will allow Diageo’s new brewery in Baltimore County to move forward. But the amended Bill 1283 is a mug half full, with the state’s craft brewers inevitably seeking more in the future. A brief refresher. Diageo, owner of the world-famous Guinness brand, announced plans to open its first U.S. brewery in more than sixty years in Baltimore County a few months ago. Diageo did not ask for a state subsidy, but it did ask for permission to sell 5,000 barrels per year from the brewery’s taproom, up from the state’s current 500 barrel limit (by far the lowest in the country). 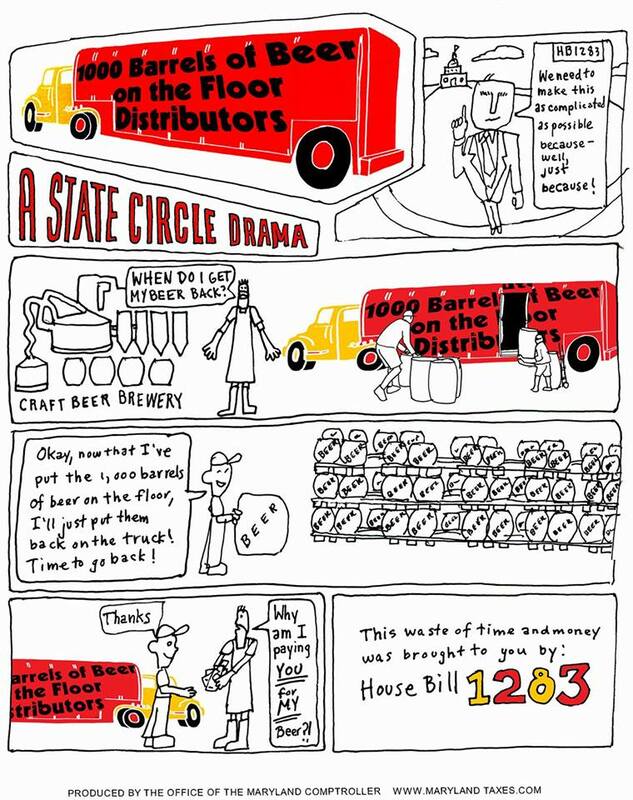 A bill passed by the House of Delegates raised the barrel limit to 2,000 (with another 1,000 allowed if bought from a wholesaler), but it also cut back hours of operations and prohibited off-site contract brewing, a major hit on the industry. After an outcry from brewers, the Senate amended the bill to allow a limited amount of contract brewing and to grandfather the hours of existing breweries and those in the approval process (including Diageo). The House passed the amended bill on Sine Die. The deal allows Diageo to come to Maryland, and that’s a good thing. But it also contains two counter-productive elements. Brewery taprooms are now allowed to sell 2,000 barrels directly to customers each year. (The next-lowest state, North Carolina, allows 25,000 barrels.) Breweries can sell another 1,000 barrels, but to do so, they have to go through a wholesaler. That means loading the beer on a wholesaler’s truck, sending the truck to a warehouse where the beer is offloaded, then bringing it back to the brewery to unload it again. FOLKS, YOU CANNOT MAKE THIS UP. The graphic below from the Comptroller’s Office illustrates how absurd this is. Existing breweries and those holding on-site consumpion permits and licenses as of April 1, 2017 are allowed to stay open as late as their local jurisdictions permit them, usually between midnight and 2 AM. All new breweries must close by 10 PM, slamming the door shut on further growth. The State of Maryland is effectively telling the craft beer industry the following: We don’t like you. We will tolerate those of you who are already here, but we don’t want any more of you. Contrast this with Virginia. The Commonwealth’s Governor, Terry McAuliffe, is a joyous deal-maker, back-slapper and salesman who loves bringing employers to his state – especially craft breweries. 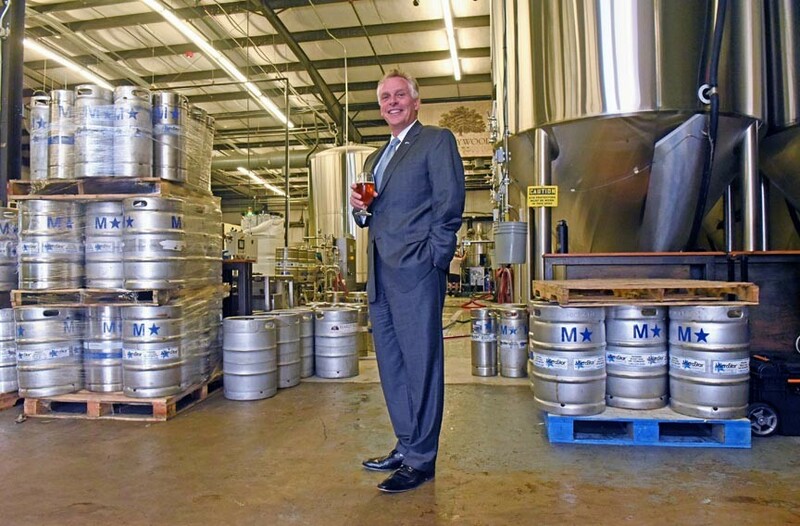 McAuliffe promotes the industry every chance he gets, including the creation of Stone Brewing’s special beer in honor of Virginia, Give Me Stout or Give Me Death. His term has seen almost 100 new breweries open in the state. Perhaps his greatest achievement was a successful four-year campaign to entice Oregon’s Deschutes to open near Roanoke. Virginia’s Beer Drinker in Chief. Photo credit: Richmond’s Style Weekly. Here is McAuliffe bragging about Virginia’s booming beer industry to Hampton Roads’ WAVY TV just last week. Governor Terry McAuliffe spoke to the National Craft Breweries Association in Washington D.C. Tuesday evening to give his best sales pitch to attract new beer businesses to Virginia. “We got Stone to move here, and we got Deschutes to move here, we’ve got Ballast Point to move here, Green Flash, I mean, no one has had the success we’ve had the last two years recruiting major known craft breweries,” McAuliffe told 8News Reporter Jonathan Costen, pointing out that the booming beer industry has brought hundreds of jobs to the area. “We have 190-craft breweries in Virginia today. It’s a billion dollar industry for us, so I believe it really helps our tourism. “Folks come, they love to come to our craft breweries, but in addition to that, these craft breweries are all buying locally produced products, it is great for our farmers. We can’t produce enough hops here, so I tell people go out and start a hop farm here in Virginia,” McAuliffe added. 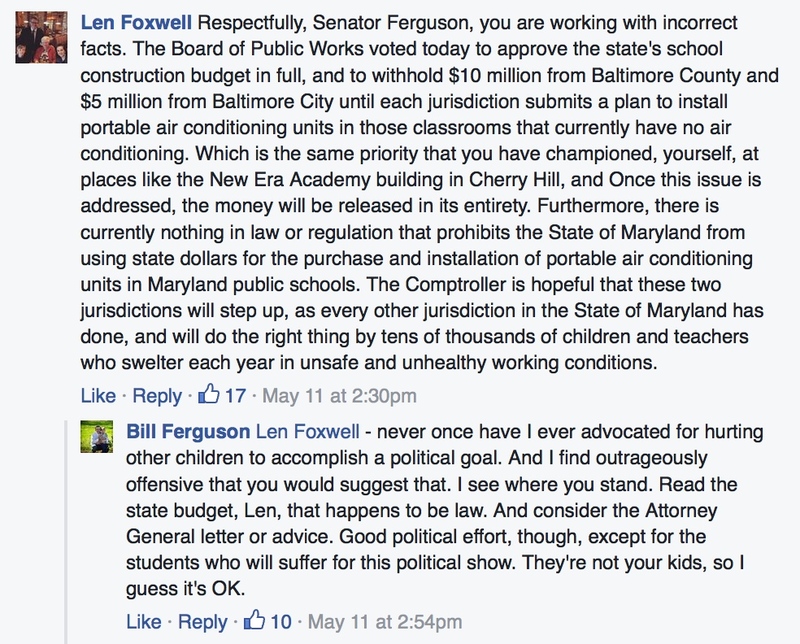 McAuliffe’s message is the polar opposite of Maryland’s. 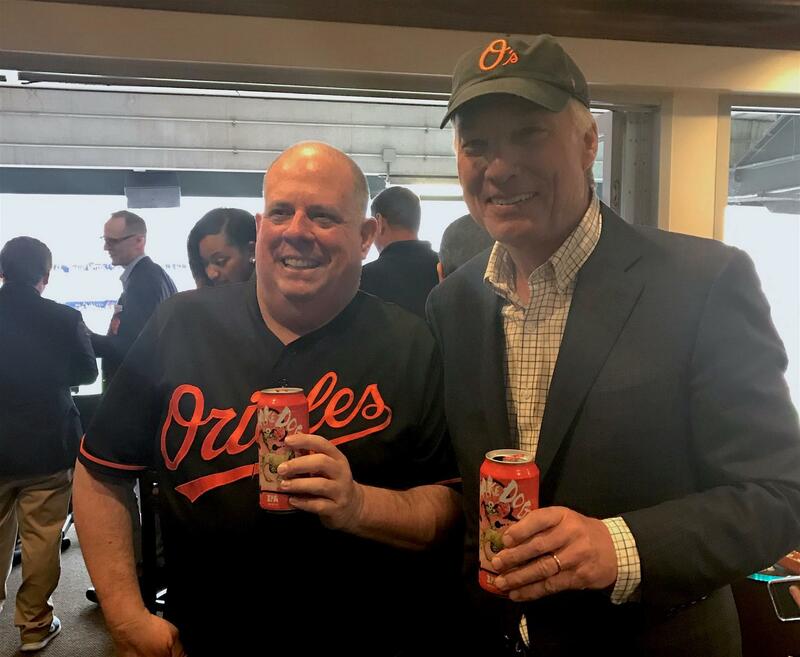 One elected official who understands the economic and cultural potential of craft beer is Comptroller Peter Franchot, who aggressively defended the industry during the debate over Bill 1283. The Comptroller is now convening a task force to study the state’s beer laws from top to bottom with the goal of producing model legislation next year. An interesting question is whether Governor Larry Hogan will come on board. The Governor has allied with Franchot on more than one of his ideas in the past, including school air conditioning and starting school after Labor Day. Craft brewing is a natural issue for Hogan, given its potential for job creation and the Democrats’ near-fumbling of the issue this year. Just two guys enjoying some great Maryland craft beer. Photo Credit: Peter Franchot. Maryland’s iron cartel of manufacturers, wholesalers, licensees and supportive politicians has kept in place a stable, profitable system for a long time. The just-concluded brewery bill is only the most recent manifestation of their control of Annapolis. So opening up the beer industry is an uphill battle. But if Franchot, the craft industry, its customers and maybe Hogan can make this a signature issue in an election year…? Well, pull up a stool, grab a mug and get ready for the show! 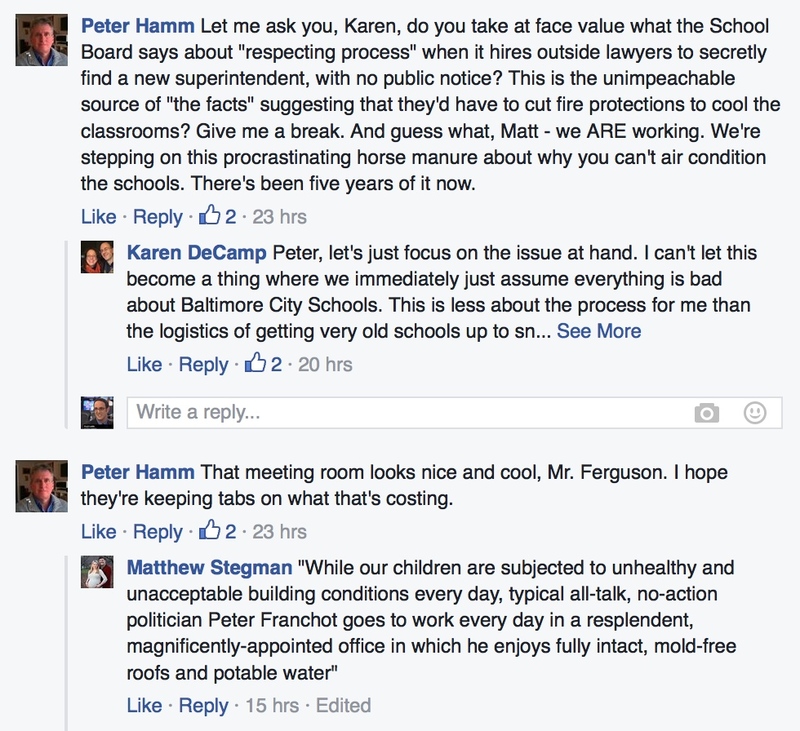 Disclosure: Your author has done campaign-related work for Peter Franchot in the past. 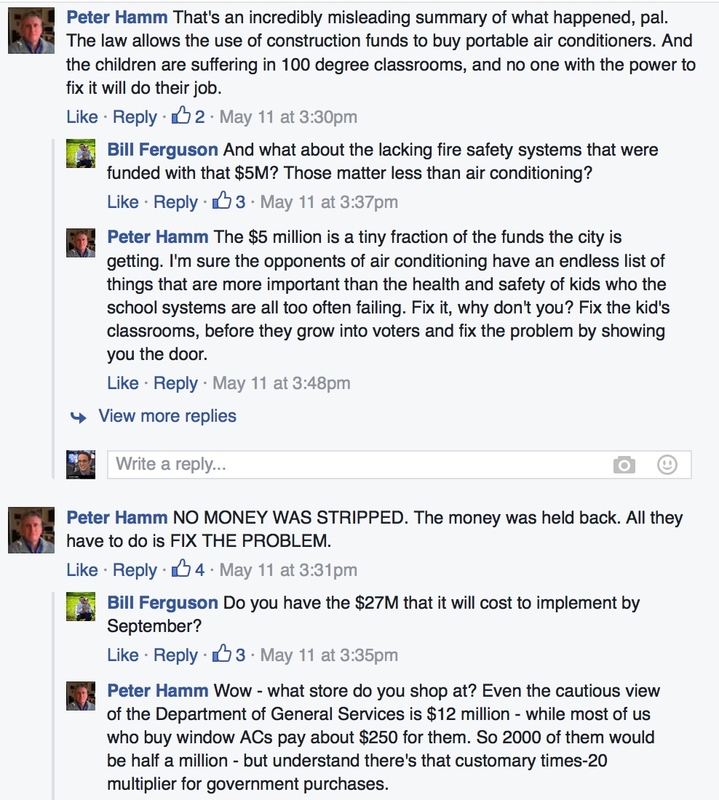 His positions on issues like this one, including Montgomery County’s liquor monopoly, have earned my support. Senate President Mike Miller and Comptroller Peter Franchot have renewed their decade-long feud, to the delight of journalists, bloggers and pundits alike. Whether it’s about slots, tax collection issues, Baltimore County public school air conditioners or just the joy of a good barroom brawl, the Miller-Franchot war sometimes abates but never ends. Speculation pops up every couple of years that the Senate President will find a challenger to take the Comptroller out. After all, Miller is arguably the most powerful non-Governor in Maryland history and the statehouse is his domain. But outside the statehouse, Franchot is King. Why do I say that? Consider the following. Below are the vote totals and percentages of major party candidates for Governor, Comptroller and Attorney General for the last two general elections. (Attorney General Doug Gansler, who had no opponent in 2010, is omitted.) Franchot’s results are the best in the field. In fact, to find statewide politicians who regularly matched or exceeded his margins, you would have to go back more than a decade to the days of William Donald Schaefer, Louie Goldstein and Joe Curran. Lieutenant Governor Anthony Brown was the ultimate creation of the state Democratic establishment. And Franchot? Well… let’s just say he’s not. Below is a comparison of the votes obtained by the two in every county in the 2014 general election. 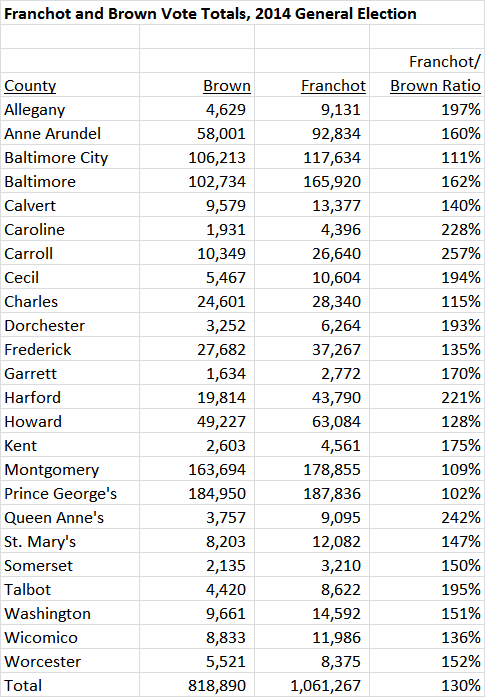 Franchot received more votes than Brown in every local jurisdiction, including Brown’s home base of Prince George’s. In the big three liberal jurisdictions (Montgomery, Baltimore City and Prince George’s), the vote totals for Brown and Franchot were similar, suggesting that loyal Democrats supported both of them. Franchot’s edge came from the rest of the state. He received at least 50% more votes than Brown in 15 of 24 counties, including the critical swing jurisdictions of Baltimore County and Anne Arundel. 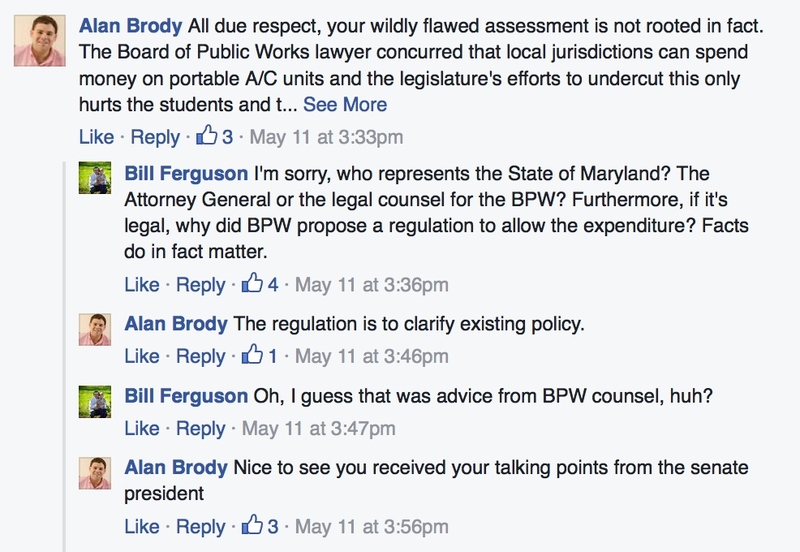 Brown carried just four jurisdictions against Larry Hogan – Prince George’s, Baltimore City, Montgomery and Charles. Franchot carried all of them in the general election, plus Anne Arundel, Baltimore County, Dorchester, Howard, Kent and Talbot. 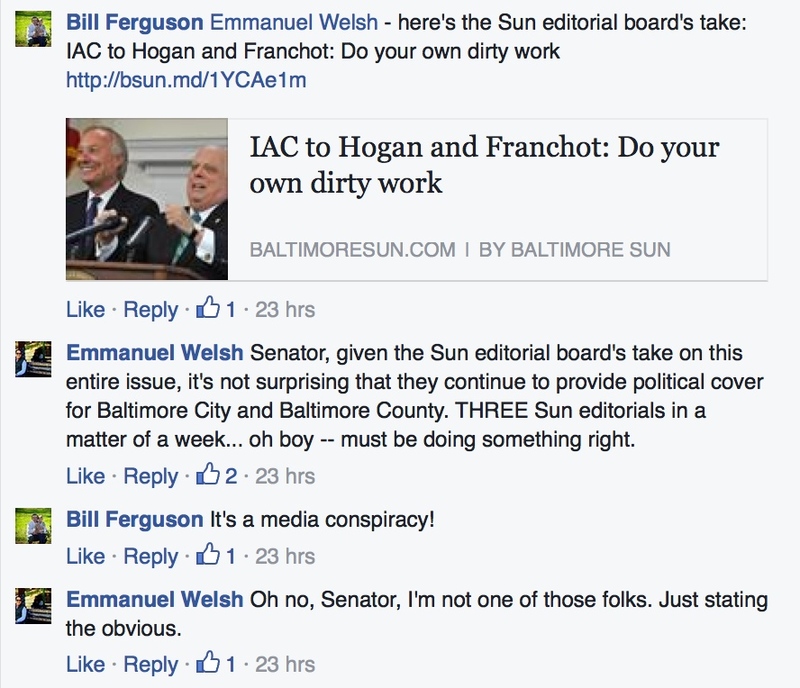 Tell me again why Franchot should fear the establishment? The State Board of Elections has data on the performance of Franchot, Brown and Hogan for every one of Maryland’s 67 legislative districts and sub-districts. (The state has 47 Senate districts but many of them are carved up into smaller sub-districts for Delegates.) This further illuminates the electoral dominance of Franchot over Brown. Franchot received more votes than Brown in 63 of the 67 districts. All four in which Brown did better were in Prince George’s. Franchot received more votes than either Brown OR Hogan in 32 districts – nearly half of them. Franchot’s occasional deviations from progressive orthodoxy didn’t hurt him in liberal Montgomery or Baltimore City, as he out-polled Brown in every district either entirely or partially within their boundaries. In the following nine districts, Franchot received more than twice as many votes as Brown. These districts go from moderately red to deep red. They are represented by a combined 8 Republican Senators, 21 Republican Delegates and 1 Democratic Senator – Baltimore County’s renegade blue dog, Jim Brochin. In many of these places, liberal Democrats are considered alien life forms. But Franchot has a following here. Perhaps the most interesting of these districts is Dundalk-based District 6. Dundalk is a fabled ancestral home of white, blue-collar, unionized Democrats, but it has been trending to the GOP. In 2014, Hogan defeated Brown here with 76% of the vote. Democratic Delegate John Olszewski Jr. lost the Senate race to unknown Republican Johnny Ray Salling, who raised just $15,429. The district’s three Delegate seats flipped from all Democratic to all Republican – and it wasn’t close. A Republican succeeded Olszewski’s father in Dundalk’s County Council seat with 62% of the vote. Baltimore County Executive Kevin Kamenetz lost the fifteen Dundalk precincts to an obscure, underfinanced Republican by a 59-41% margin. Attorney General Brian Frosh lost to a no-name Republican here by 53-41%. But Franchot won the district 52-48. I know what you’re thinking: Franchot had a weak opponent. Sure. But 2014 was a year in which seemingly weak Republicans had great success. They knocked out numerous Democratic incumbents, including prominent ones like Olszewski, Senator Roy Dyson, Delegates John Bohanan, David Rudolph and Norm Conway, and Wicomico County Executive Rick Pollitt. They came close to defeating Brochin and Senator Ron Young. The ultimate no-name Republican was Larry Hogan, a man who had never served in public office, had no starting name recognition and had to draw on public financing to compete with the MUCH better funded Anthony Brown. Remember when Brown referred to the general election as “a little bit of a mole hill?” But Hogan won in the best year in recent memory for “weak” Republicans. Amid all this tumult, Franchot increased his win margin in the general election by two points over 2010. Here is the key question: could it be that Franchot’s socially liberal, fiscally moderate stance combines the best of Hogan and Brown and has made him Maryland’s most popular state-level Democrat? Maryland voters approved gay marriage and the Dream Act in 2012, and according to a recent Washington Post poll, support many liberal priorities. But they elected an openly anti-tax Governor and, according to the above poll, rank the economy and taxes as their second and third issue priorities. (Education is number one.) This mix of liberalism and moderation fits Franchot’s issue profile better than any other prominent Maryland politician. Democrats should ponder all of this as they prepare to campaign against Hogan in 2018. For the vast majority of my Facebook friends who have better things to do than keep up with the State Circle sandbox, and have asked me what all of this is about, here’s what Senator Miller’s latest attack boils down to. First, I’m an independent voice for the taxpayers of Maryland, who gave me this job that I love and who pay for my salary. 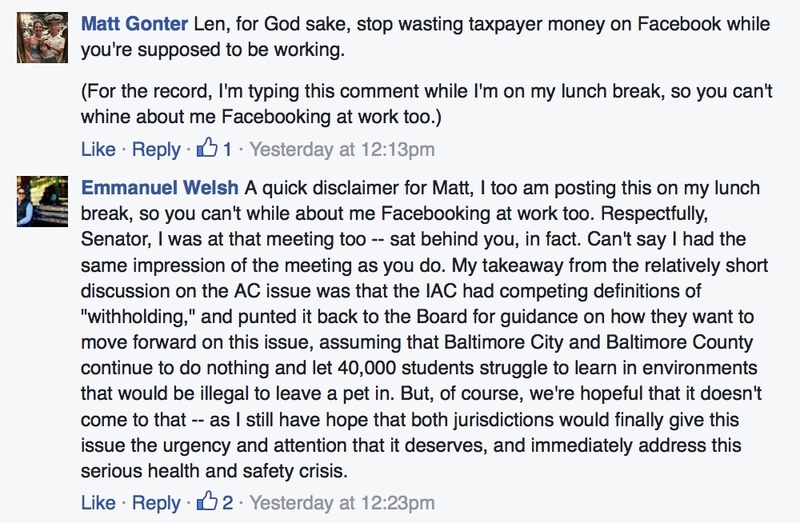 I work for you – not for Senator Miller or any other Annapolis party boss. Second, while I’m a lifelong progressive on social issues, I’m also a fiscal watchdog who is happy to work with responsible leaders from both parties to ensure that taxpayer dollars are spent more efficiently, and to hold the line on higher taxes and unsustainable debt. For a backroom partisan like Senator Miller, who must destroy the Republicans at all costs in order to recover his grip on patronage appointments, preserve his grip on the redistricting process and such pursuits, my preference for bipartisan government is an act of heresy that is best snuffed out. I offer this not in a spirit of anger or resentment of Senator Miller, because he is simply doing what Annapolis bosses do. I offer this simply to provide context to those who might otherwise be inclined to take the Senate President and his comments more seriously than they should. That said, enjoy your Friday and a relaxing weekend! I’m sure Republicans are enjoying gleefully this intraparty feud. Comptroller Franchot has certainly given back as good as he got yesterday from Senate President Mike Miller. At the same time, it’s hard to imagine this statement will help improve relations with General Assembly Democrats, who wish that Franchot would carry water for them instead of the Governor more often. Yesterday, one had to chuckle when when Mike Miller said “I’m not going to name his name.” Though technically true, it self-evident that he was speaking of Peter Franchot. Peter Franchot’s statements that he does not harbor “a spirit of anger or resentment” after a blunt, return attack towards Miller in the name of providing “context” inspire as great an eye roll. But let’s hold off on labeling either of these people as insincere–or at least more so than the rest of us. The media routinely places politicians in an impossible position. Would anyone be shocked if Peter Franchot felt “anger or resentment” after Mike Miller’s comments? Except Franchot would be criticized as petty if he did not disclaim being so. Yet denying this normal human response looks disingenuous, especially after his scathing critique of Miller. And people wonder why politicians sometimes look like a pretzel married a robot. He [Trump] is like one of our state officials. I’m not going to name his name. He’s a fraud. He was a moderate Democrat who is now transforming himself saying I’m a right-wing tea party conservative to get the vote. That’s nonsense. You’ve got to be true to yourself. He’s not true to himself as are other politicians that we know. It’s an open secret that the state official who shall not be named is Comptroller Peter Franchot. Miller has been feuding publicly with the Comptroller, attacking him in a scathing public letter. Miller has been critical of Franchot for grandstanding and his now routine support of Gov. 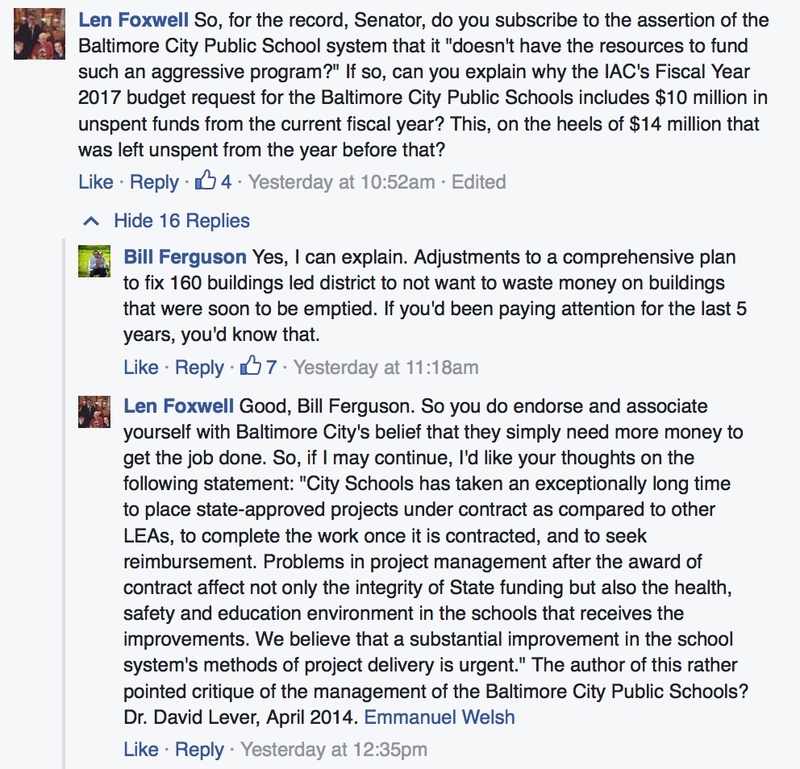 Hogan on the Board of Public Works. So in essence, Miller’s argument is that Franchot has become exactly the portrait he drew of his opponent in 2006. Indeed, Franchot’s reply to Miller’s letter was highly complimentary of the Governor while critical of General Assembly Democrats. Mike Miller is a centrist Democrat, so one can only imagine how liberals in the General Assembly view Franchot’s actions. I’d say Franchot is headed for uncharted waters except that, based on his own 2006 primary campaign, Franchot should know exactly where the course he is charting heads.